The talks between the Cuban leader and the pontiff in Vatican were strictly private and lasted for about an hour. According to Cuban and Vatican officials, Castro made a stop in the Vatican on the way back from Moscow’s V-Day celebrations to thank Pope Francis for his mediation between the US and Cuba. "I thanked the Pope for what he did,” Castro told reporters as he left the Vatican, adding he was "really impressed by his wisdom and his modesty." “When the pope goes to Cuba in September, I promise to go to all his masses, and with satisfaction… If the Pope continues this way, I will go back to praying and go back to the church, and I'm not joking," the Cuban leader said, AP reported. Castro’s willingness to go back to church cuts across his political beliefs. Following the Cuban Revolution in 1959, the authorities restricted religious practice. In the 1990s, Havana adopted a milder position towards confessions and lessened the promotion of atheism. Later, Pope John Paul II visited the island in 1998, and President Fidel Castro, who served from 1959 to 2008, reinstated Christmas as a holiday. Castro presented Pope Francis with a painting by contemporary Cuban artist Kcho (Alexis Leiva Machado) which was inspired by the pontiff’s commitment to bring the plight of migrants and refugees to the attention of the wider world. Francis, in his turn, gave Castro a medal depicting St. Martin of Tours, one of the most familiar and recognizable Christian saints. "With his mantle, he covers the poor," Francis told Castro. Pope Francis added that he would continue to be supportive of the reconciliation process. It emerged that he had sent a personal letter to both US President Barack Obama and Castro during the summer of 2014. “Pope Francis sent letters to President Obama and to Cuban President Raul Castro this past summer, urging a resolution of the matter of prisoners and progress in our bilateral relationship,” US Ambassador to the Vatican Kenneth Hackett said. 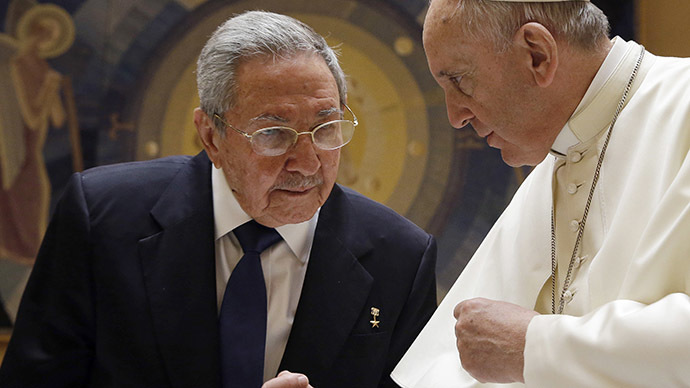 The Vatican was also responsible for playing host to meetings between Cuban and US officials.